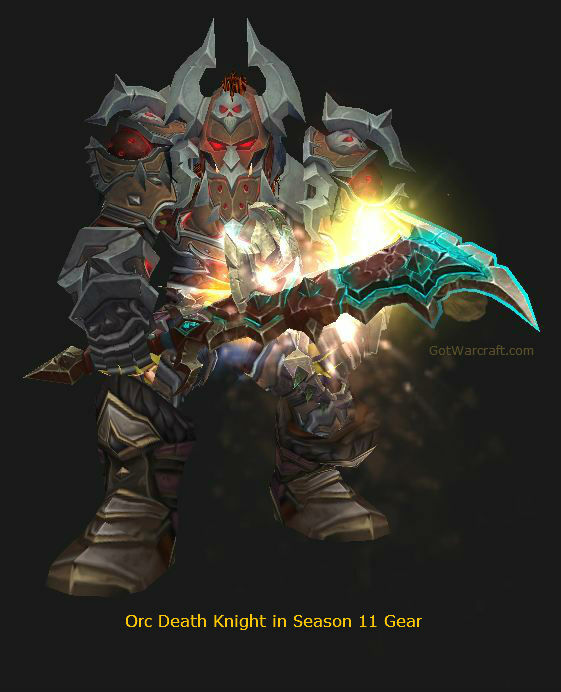 Legion is here, are you prepared for Unholy Death Knight PvP? There are a number of changes, including the level 110 PvP talents, removal of Multistrike, removal of PvP specific gear, more “smoothing of rotations,” and, oh yeah, that you’re even more unholy than ever before. If you’re not yet level 110 then you won’t be able to use everything on this page. If are interested in getting your character to max level quickly, take a look at this leveling guide. Depending on the situation you may want to switch talents around. With all the different forms of PvP out there you might want to switch things up. Keep a stack of Tome of the Tranquil Mind handy for doing just that, otherwise you will have to get to an area that allows for “rested XP” (Inn, etc.) With the Tome you have one minute to change them any way you like. Note that switching specs does not require a tome. Want to change to Frost for one fight? Just get “out of combat” and switch. You do have the artifact weapons for the other specs, right? Unholy PvP talents require you to be level 110 and to earn a certain honor level. For those, see below. Bursting Sores: The best talent for most situations. This makes popping festering wounds an area attack and just does a lot more damage overall. Epidemic is Nice when you have all of the opposition infected. You flare the disease and damage all of them and any other enemies nearby. Better for those larger battleground (or Ashran) groups than solo or 2s. Pestilent Pustules: The extra runes generated allow for more Festering and Scourge strikes overall. Clawing Shadows: A ranged Scourge Strike that does Shadow Damage (which is directly increased by your Mastery stat.) If you find that you have need of an addition ranged attack, such as when fighting people who will kite you, then pick this one, otherwise Castigator is better. Corpse Shield: 90% of all damage you take is redirected, for 10 seconds, to your pet (which may well kill it.) Make sure you have your pet huddle or use Protective Bile to soak that damage. If you have All Will Serveyou can resummon your pet without the usual cooldown and keep the 90% damage reduction up for as long as possible. This is the best of this set for almost everything you’ll encounter while leveling. Shadow Infusion Enables a higher of uptime on Dark Transformation due toDeath Coil reducing the cooldown of Dark Transformation> by 5 seconds when Dark Transformation is not on your ghoul. If you’re spending your Runic Power on Death Strike (heals,) while solo leveling, then it’s (much) less effective. If you’re not Death Striking (because you have a healer, for example) then this is the best pick. In Legion, Honor and Conquest will no longer be currencies that you use to buy gear from vendors. Instead, characters who have reached maximum level will earn Honor Points from competing in Battlegrounds or Arenas, similar to how lower-level players earn Experience Points. As you earn Honor Points, you will increase your Honor Level, up to the maximum Honor Level of 50. Along the way, you’ll earn a number of rewards, including Gold, Artifact Power, and a brand new set of PvP-only Honor Talents. One more note, you get access to the first column, not the first row as your honor level increases. At honor level 10 you will have the entire first column. 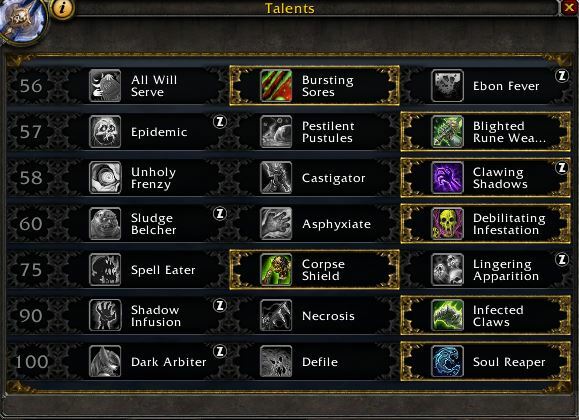 At 13 you can access the first talent of the 2nd column. At 46 you can access all of the PvP talents. Legion has done away with glyphs as we knew them. You now have access to minor glyphs which change the appearance of some effects, such as your anti-magic shell. You also have access to Vantus Runes, which increase your Versatility stat, but only when fighting raid bosses, not players. In PvP combat all stats are “normalized,” so your careful stacking of whichever stat doesn’t matter. Your set bonuses, enchants, legendary bonuses, or trinkets will be deactivated. You will get a preset set of stats that are (hopefully) appropriate for Unholy. In Warlords Hit, Expertise, PvP Power, and Resilience are all dead. So is Reforging. You have one new stat: Versatility. Again, those priorities are only relevant in situations where stats are not normalized. Strength is your Attack Power and adds to everything you do and it’s present on most all of your gear. Mastery is important since Shadow Damage makes up a good part of your overall damage. It’s a straight up DPS add for a lot of what you do. Versatility is an add to all of your damage, all of your healing, and also (at half value) to your damage reduction. It adds something to your survivability, which the other stats do not. This makes it more valuable as a PvP stat than as a PvE stat. Haste speeds up rune regeneration and how fasts your DOTs act. Decent stat, but still not Mastery. Crit is a solid stat, but the others will do more overall damage. If you took the Castigator talent then Crit is much more valuable. There are a few changes to PvP gearing in Legion, none of which will make any difference at all. Yeah, right. No more honor or conquest points. You now get Honor Levels, which unlock the talents mentioned above, plus gold, and artifact goodies. No more PvP specific gear and no more PvP vendors for Legion gear. All PvP gear will be awarded through the same Strongbox system used in Warlords. By winning, or at least doing well, in skirmishes and the Battlegrounds you will have a chance to win one of these boxes. Each will contain a piece of gear about equal to that of a heroic dungeon. Higher level PvP awards higher level (raid level) gear. Why bother with PvP gear? Because item level does count, somewhat. If you have +50 item levels over your opponent it’s effectively five item levels. So 10% of the listed item level increase in your power. Artifact power and levels do count, so you’ll have a small item level advantage, your superior artifact, and your consummate skill at PvP as advantage over that newb, er… skilled opponent you’re attacking. So How Do You Gear? Get the highest level gear that you can. Item level still counts, if not as much as before. Improve your artifact as much as possible. That weapon is not “normalized” in PvP. Then you work on your skills. Freshly level 90? Get the Crafted Malevolent set, if it’s available on the Auction House or through a Blacksmith. Alternatively, grinding the Timeless Isle for boxes and the armor tokens will get you a full set of 496 gear with zero gold outlay. Or you can spend some gold on the valor gear at the valor vendor. Level 91+ – you can equip three pieces of crafted gear if you either have Blacksmithing or you’re fairly rich. You can buy or make, with Blacksmithing, and use three pieces of ilevel 630+ gear, which is good enough to start PvPing. Buy or make the weapon, chest, and legs (for the best stats.) These items can be equipped at level 91. Ideally the secondary stats on these should be Multistrike & Mastery. Your Truesteel Grinder will reroll the stats on the weapon and your Truesteel Reshaper will reroll it for the armor pieces. The above will go much faster with your garrison forge and a minion assigned to the forge. Alchemy 500 will let you make a sweet DPS/heal trinket: Draenic Philosopher’s Stone. It can be upgraded in 6.1. Note that if you have way too much gold you can buy nice gear on the Auction House that can be equipped at level 101. Item level does make a difference in PvP, even if it’s smaller than before. 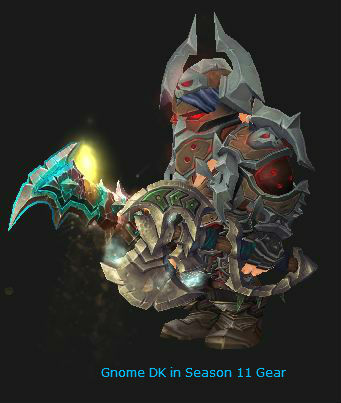 Of course, you can actually earn gear through BGs and so on. Strength is your best stat. You should match socket colors for the bonus. Save some money: “Perfect” gems have the same stats as the regular gems, but one or the other is likely to be listed on the Auction House at a much lower price. Grab that one. If things are still a bit tight then get to work on earning more gold. Meta: Reverberating Primal Diamond will be your basic choice, though if you PvE then Capacitive Primal Diamond isn’t bad at all for World PvP. It does not proc in BGs or Arena. Tyrannical Primal Diamond is your final pick, if you’re just that good, and need a bit more defense. Well, you aren’t. Gemming, that is. Currently no gem sockets are actually available on PvP gear, but perhaps they will be as the expansion progresses. They do have a (small) random chance to appear on Raid gear. Also, there are no meta gems or sockets, there are no socket bonuses, and all sockets are “prismatic,” which means that they will take any available gem. Assuming sockets become available in Warlords: gem for Mastery. Gemming Unholy, in case PvP gem sockets become available. All the other Warlords enchants are secondary stats only. Enchant for Mastery, though others are shown if you want to experiment. In Warlords of Draenor all racials that added Hit or Expertise are now dead. All races also now offer something that adds to damage, so they are closer than before. Best race? Undead. What else fits Unholy so well? Human: Escape sheds stuns with a 3 min cooldown, 1% bonus to all secondary stats. Note that Pandarans cannot become Death Knights, they’re probably not Unholy enough. Their Arcane Torrent briefly silences all nearby opponents and restores a bit of Runic Power. Stone form washes away bleeds and other effects and and reduces damage. +2% to critical effect to damage and heals. Escape removes stuns, but not other movement restricting effects. Small size counts, expertise is useful if you’re dual-wielding one hand swords. Gnomes have an escape, which is not quite as good as the human ability, but still nice. Blood Fury for the burst, stack it with your other procs and buffs. reduction in duration of slowing effects. Already Unholy, so what could be better? Indefinite Underwater Breathing might have some situational use. If you’re working on a profession then you should level it to 700 as quickly as you can. The crafting professions can be expensive to level and can be very expensive if you’re buying your materials. Take a look at this addon to help with earning enough gold to afford to do what you want to do. Why get a profession since there are no bonuses? For the item level 640 gear that you will, eventually, be able to create. That gear requires level 91 to equip. Said gear require a lot of materials to create, your Garrison will be a big help here if you create a professional building. Blacksmithing allows you to make some nice (ilevel 630+) plate gear and weapons. There are various playstyles and what you can do, or will want to do, at any given time will vary with your runes and runic power. Note that Dual Wielding is a waste of time as Unholy. Practice relentlessly. Use the target dummies, the proving grounds, and other players. It will help you to get your rotations down so that they are automatic. Also, you want to learn manage your runes and the low pressure practice will help. Ask questions of better players. Some people like to use Recount to track how much damage they are actually doing, as opposed to what they think they are doing. Your diseases base their damage off of your Str and whatever buffage you have at any given moment. Keep them on your target(s) at all times and when the buffs proc your diseases will adjust accordingly. Outbreak or Plague Strike can be used to apply diseases to begin an encounter or to refresh your diseases, Use Festering Strike to extend their duration. Necrotic plagues will spread on its own, you can help it along with Blood Boil. The goal here is to have your empowered ghoul up as often as possible. Pet control is important as you will want it to be attacking the correct target. It accounts for a good portion of your damage. Death Coil is used to build charges of Shadow Infusion on your ghoul which can then use Dark Transformation once it has 5 charges. Death Coil should be cast whenever you either have excess runic power or when Sudden Doom procs. It will also build Blood Tap charges if you took that talent. Dark Transformation should be used whenever it’s available. Note that your ghoul cannot build charges of Shadow Infusion while Dark Transformation is active therefore you should save your Runic Power for the duration of the transformation and then immediately cast it as many times as possible, once the transformation ends, to build charges back up. Icebound Fortitude – save for when the enemy bursts or otherwise usess his big attacks. Healing CDs likewise can also be saved for burst phases. Glyphed Icy Touch dispels useful effects, such as their Master’s Call, Pyroblast, etc. Anti-Magic shell can block a lot of roots and CCs, as well as damage. If you can anticipate an incoming CC you can preempt it with AMS. Dark Simulacrum (and the glyph) have some nice utility. You can swipe a Paladin’s bubble, a Mage’s sheep, a Priest’s Fear, a Druid’s Cyclone, a Shaman’s Hex, etc. Empower Rune Weapon – Activates all runes and adds 25 Runic Power. 5 min cooldown. Use when running on “empty” or to line up certain strikes. Your DOTs (diseases) account for a lot of your pressure and should be spread as much as possible. Use Outbreak or Plague Strike to apply diseases. The disease will scale dynamically with your damage procs/buffs. You do not have to wait for a proc to use them. Your Plague Strike will apply both diseases, saving you a use of Outbreak. Blood Boil, Icy Touch, and Festering strike are used, in part, to convert their runes to death runes. Scourge Strike is your basic strike, it does more damage to infected targets. Defile (Death and Decay) if nothing else presents itself. Soul Reaper when the target is at 45% (without the perk it’s 35%) or will be there within the 5 second delay. Use it whenever it’s available. Summon Gargoyle, preferable with procs, and when lining up your kill. Your Death and Decay (Defile) plus diseases can combine to apply a lot of pressure. Blood Boil when you have at least two enemies in range. Spread those diseases. The bursting priority is as follows. Death Coil to dump all the runic power you have built up and burst down your target and build stacks to empower your Ghoul. Stack those procs! Make sure you stack as many procs as your possibly can during your cooldowns for maximum burst. So Ok, you can just buy a level 100 DK these days for only $60. Why buy a guide, other than it’s less money? For one, it’ll be updated for Legion. That’ll make those ten levels easy peasy. Also, you can follow the quest guide to earn rep and farm gold (from completing quests and selling items) and a pretty good rate. This is nice since you start with only 150 gold to your name. Same thing if you want to stick to a particular level (70, for example,) and do that level PvP. Turn off your XP, but do quests to kill time while waiting for Queues to pop. Get the rep and the gold. As you know, Unholy Death Knights do a ton of damage and have solid defenses, so leveling is going to be easy. Still, there are thousands of quests and a bazillion mobs to kill (not to mention other players.) Sorting out which quests are best and which series of quests will get you to 110 the fastest is the issue, otherwise you can waste a lot of time running hither and yon, getting nothing useful done. This is why we highly recommend Zygor’s Guide. 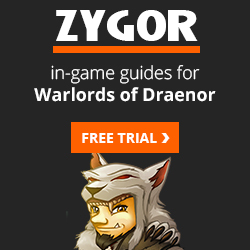 Zygor’s is an in-game guide and it almost automates the whole leveling process: you just pick your starting point, whatever level you are, and the guide tracks which quest you’re on, tracks the quest objectives, and automatically advances and updates as you complete your tasks and quests, and switches to the next quest you need to do. In addition, a waypoint arrow is set automatically, so you never have to any doubt as to where to go. All of the important quest info is also included in the guide so you never have to wonder what to do. Playing with Heirlooms and/or Recruit a friend? Gaining a few Unholy levels in the dungeons or in PvP? Zygor has your back. The guide knows what level you are and will correctly suggest where to go next. It will also help you to dump all of your obsolete quests (if you want to do that.) And you will probably never have a need to look at your quest log again.